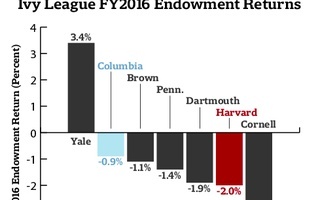 In a rough year for university endowments, Yale returned 3.4 percent on its investments in fiscal year 2016, beating out Harvard’s negative 2 percent returns over the same time period. 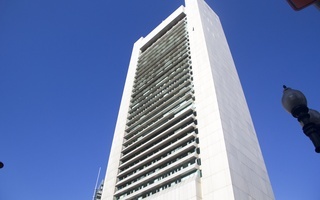 Harvard Management Company announced yesterday that the University lost almost $2 billion in endowment value—the largest loss since the financial crisis—during a difficult financial year for large institutional investors. And while Yale also lost total value on its endowment, having to pay out a portion to the university’s operating budget, it still managed to make money on its portfolio. 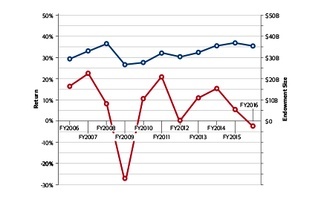 While Harvard has won the past nine meetings of The Game, the Yale Investment Office has fared better in its endowment performance, earning higher returns every year since fiscal year 2011; last year Yale returned 11.5 percent to Harvard’s 5.8 percent. And it’s not just Yale: Harvard has recently lagged behind several Ivy League and peer institutions with regard to investment returns, drawing the concern of University President Drew G. Faust when she was asked about the topic last October. Yale has also enjoyed a relative stability among its executives while Harvard has recently shuffled between CEOs. Harvard is searching for someone to permanently replace Stephen Blyth, who stepped down as CEO in July; the next CEO will be the fourth in 10 years. David Swensen has led the Yale Investment Office since 1985. Harvard’s endowment is now $35.7 billion while Yale’s is $25.4 billion. 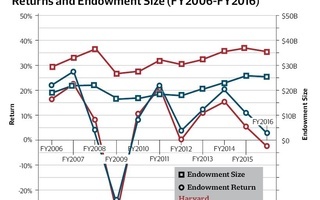 Harvard’s endowment grew slower than was average for university endowments in fiscal year 2016, according to a recent report from the National Association of College and Business Officers.